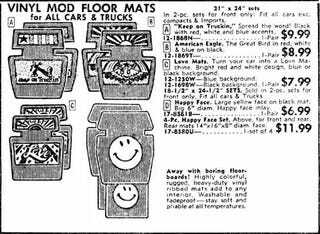 Even the '75 Matador with Oleg Cassini interior would have been improved with the addition of a set of JC Whitney's Vinyl Mod Floor Mats (and it goes without saying that a Yellow Bird Firebird shouldn't have been seen in public without them). With your choice of four grotesquely dated designs, you'd be sporting up-to-the-minute styling well into the early days of the Quaalude Era. Mod!